Okay, so it's not exactly a cotton swab, but still. I was flipping through Nylon magazine the other day (which has a great beauty section, something I would not have guessed) when I spotted this little contraption by De-Coy called Panda Pen. At first glance it sounds amazing, seeing as how it has the word "panda" in its name and claims to magically correct eye makeup. However; upon further investigation (I looked up the website) this thing is a $30 eye makeup remover dispenser. You even have to rub the product around to remove excess makeup with your own finger. Your. Own. Finger. Thirty dollars later. So I guess I won't be purchasing this, which makes me sad, mostly because I really like to purchase things. If you're concerned that I may be overreacting check out the video on the website of the product "in action". 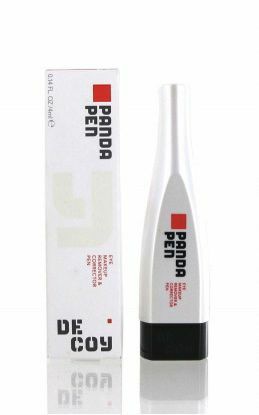 Or I can just sum it up for you: a girl that may or may not be wearing eye liner clicks the Panda Pen to, I assume, dispense product, rubs it under her eyes and then uses a finger to remove the eyeliner that apparently only she can see.